Well, I gave Trek its time in the sun, so it's only fair to showcase some Star Wars goodness now. Besides, since I shared in the heady experience of a group heatstroke with approximately three million SW fans yesterday, I'm definitely in a "Wars" mindset. The challenge, of course, was finding SW Sweets that my friend Mike over at Great White Snark hasn't featured yet. 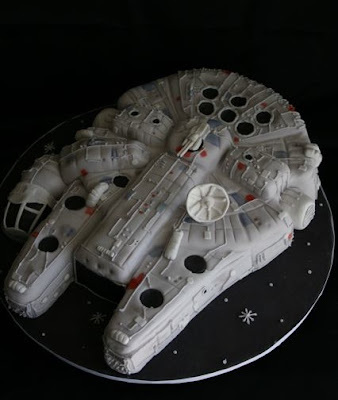 Seriously, Mike, how's about you leave some goodies for the rest of us cake-loving geeks to post, eh? Sheesh. 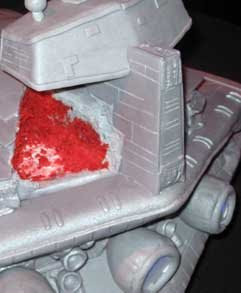 It's a good thing Star Wars fans reeaally enjoy their cake. Wowza. The gang at Charm City Cakes really rocked this one. Kudos, guys. Just look at that detail! Jyl reports that everything here is edible, too. Nice! Yep, those are the bride and groom figurines - and they dressed to match! The cake was made by the bride's friend Teresa, and the cutie-patootie Ewok cupcakes by her friend Amanda. You can see all the fun wedding pics here. After all the guests were through taking pictures with Artoo (in increasingly risque poses, I hear) the couple cut the cake - while playing the "waaaHHHH!" noise that R2d2 makes when he gets shot in the head with a blaster. Heh. Morbid, but funny. I bet the guests loved it. 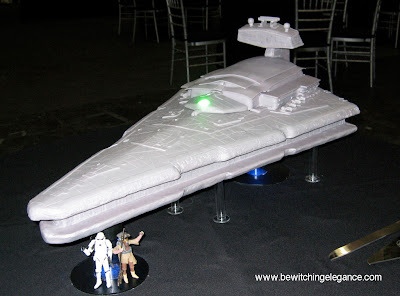 Not only is Dy a vegan baker, she also won the Star Wars Insider Best Wedding Cake of 2008 with this gorgeous Star Destroyer. 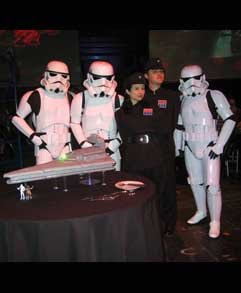 It was made for a couple who belong to the 501st, an "imperial costuming organization." Looks like it was a well-deserved win, Dy! Great job. I love how the little cupcakes with the AT-AT cake are ewoks! OMG! I want one of those Ewok cupcakes!!!! Suddenly, I want to renew my wedding vows. I think the week Half Blood Prince comes out, we should have a Harry Potter extravaganza? & I agree with Amy. I think it's amazing, still, what they can do with fondant, but to me it's more impressive with buttercream. cakes are meant to be eaten. fondant is practically inedible, therefore all cakes with fondant are wrecks in my book. 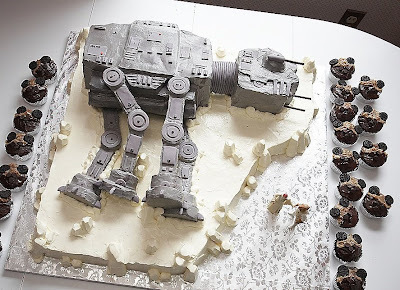 huzzah to the AT-AT cake! (and the only good ewok is an edibke ewok). You didn't mention that the picture of the bride with R2 is a pose from the hologram scene. My husband and I are part of the 501st! :) Great cakes today Jen!!! 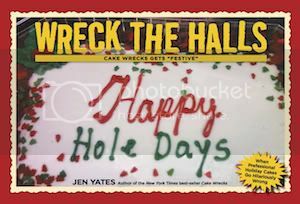 I wonder if there are any awesome Firefly cakes. That is, if you want to continue the geeky goodness. 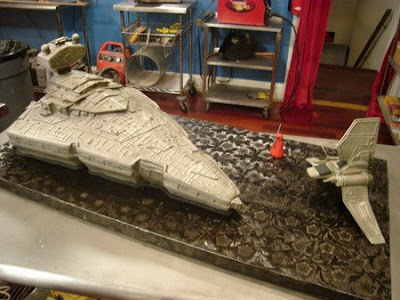 Mmmmm Cake Wars. I don't even like Star Wars, but I would totally eat those. And speaking of funny things from TV, has anyone seen this stupid game on YouTube? The groom is Admiral Ackbar? I so want to renew my vows to get one of those cakes. Hooray for the fondant free cake! Delicious! and omg are those lil ewok cupcakes?! I adore them! WOW! I so love all those cakes. I made tie fighter cupcakes once to circle a death star cake, but i'm not a pro, so it never would have looked this nice in a million years. But yay Star wars cakes! You just made my son very happy, heh. Of course, now he wants me to make him a Death Star cake for his next bday, but if I can do a Millenium Falcon, a lil' ol' Death Star is no biggy. :-P And yes, it will be buttercream FTW. I'm currently hanging my head in shame because although mine's not wreckworthy, it's no comparison! Bet you can do it. You know, I have never had a fondant covered cake! I wonder why that is? Maybe they're not that big here in Pittsburgh? hmmm...I wonder if it's because Pittsburghers only like their icing to be one of two varieties...either buttercream, or a penalty called agains the Redwings. GO PENS! I am such a dork! 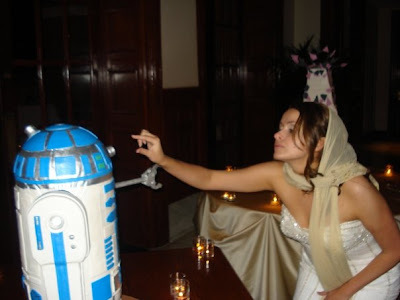 It made me very happy when I saw the picture of the bride with R2D2. I am so going to be that bride someday! I agree with Amy. I'm not fond of fondant (no pun intended) either. I've been a decorator for 20 years and I avoid it like the plague. Shout out to 1886 Cafe & Bakery in Austin! Hometown pride! Awesome cakes and great finds! The Ewok cuppies are adorable. @Charlene: I thought the same thing. I picture Akbar in a ball and chain. Even tho it's usually Leia who's in chains. I saw the bakery for the R2D2 cake, and I was so happy, because I've been there, and drive past it almost everyday. It's awesome finding out stuff like that. Kudos for doing the Star Wars sweets on my birthday weekend! SW is my favorite thing, like, ever. I know, right? Not exactly a good omen for the marriage. They couldn't find a Han figurine? 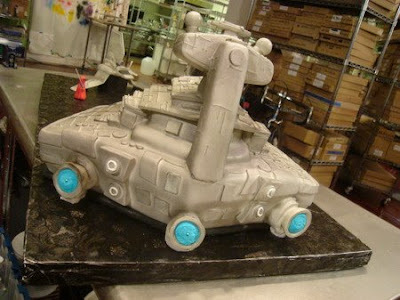 You should check out the site for the guy who did the Wall-E cake - he has a picture of a full size Yoda that is amazing! Millennium Falcon, you gotta cut back on the beer and get into a step aerobics class. You're reeeealy starting to get pudgy, dude. Wow. Those are indeed extremely impressive. Star Was and cake. Who knew they were two great things that go very well together! I`ve made many a cake that I really didn`t feel like making or found totally annoying to make but its my job....and people come up with some strange requests.My favorite silly stupid cake was the toilet cake I made for Robert Irvine.while making it I had to leave it in the deep freezer at different stages with a a sing on it "Please Don`t Touch The Potty"
The AT-AT cake and Ewok cupcakes were insanely delish! The cake was served with a squirt of a chocolate hazelnut ganache cream. It was the best wedding EVER! I should know, I officiated dressed as Yoda ;) Happy Anniversary to Ackbar and Mon Mothma! My friends Teresa and Rich made the fabulous AT-AT cake. Teresa is a baker, but the cake was not made at a bakery. My friend Amanda Longstocking made the adorable Ewok cupcakes. Cheers to them! I am not a Star Wars fan, and yet I am completely in love with the ewok cupcakes. 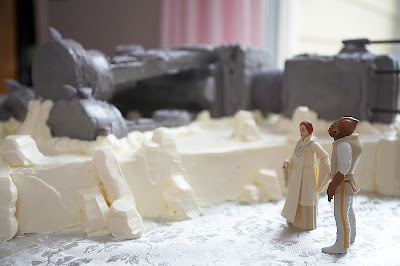 The cakes were all amazing, but were I the Star Wars Bride, I'd probably be aiming that AT-AT's barrels at the Photographer who cut off more heads than the guillotine era. 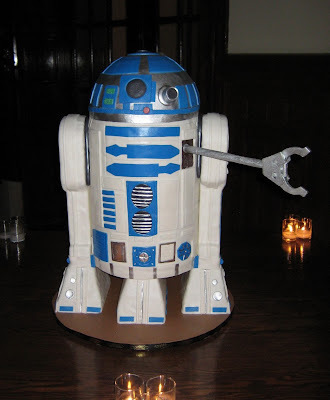 An R2-D2 groom's cake!! 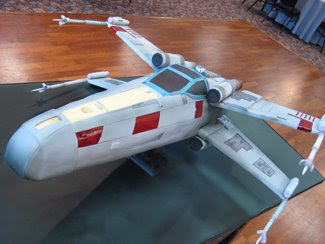 <3 Today's Non-Wreck showcase makes this longtime SW geek very happy. My CAPTCHA= endio. "The end is near-but the moment has been prepared for...."
yeah but you know what's lame about the wedding cake? Leia would never marry Admiral Ackbar. 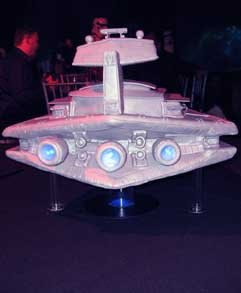 Those are the desserts and sweets made on the theme of Star Wars. I think me and my hubby should have a bite of this before we got married. That could have signified how we started our war for this star life. Theresa did my wedding cake (Day of the Dead). She is AMAZING! That's not Princess Leia with Admiral Ackbar, it's Mon Mothma. That's a couple that actually makes a certain amount of sense. Holy Sith! Those are flipping awesome!!!! !